The London Masters singles final was a cracking one. It was yet again between Federer and Nadal, a rivalry which has already become a part of tennis folklore. The players did not disappoint. Federer and Nadal have played their share of great games in the past and this was as exciting as any of them. Federer won the first set 6-3 and Nadal came back in the second with a 6-3 win himself. This is where it required one of them to up their game in the third set to grab the initiative and Federer was the one who did it this time. Roger was brilliant in the third set and I am sure that this was one of the best he has ever played against Nadal. The third set saw Fed playing risk free game and hitting winners with precision. It seemed as though Nadal was getting a little frustrated and errors started creeping into this game. Nadal started missing some of his trademark forehands and Fed was just unrelenting. 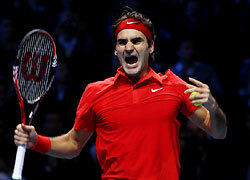 The third set was comfortably won by Federer with a score line of 6-1. This would have been one of the sweetest wins for the champion as he hasn’t had a great time in the finals against his nemesis Nadal. For Nadal though this was a rare loss against Federer, he hasn’t lost that many against him in the recent past. Probably this was the spark Federer was looking for to have one last hurrah before he retires. So people, look forward to another fantastic year for the champion, Could he push towards 20 Grand Slams? Let’s wait and see. Anyways another brilliant match between these two great players and yet another special win for Fed.